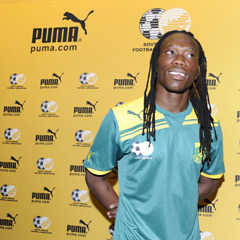 Johannesburg - Bafana Bafana midfielder Reineilwe "Yeye" Letsholonyane believes that the national team’s goal scoring responsibilities should not fall completely on the strikers, but that the entire team should contribute. According to the soccerladuma.co.za website, South Africa lost 1-0 to Norway on Tuesday at the Cape Town Stadium, in an international friendly, and although Gordon Igesund's side did create chances, they were unable to find the back of net. Saturday Bafana host Algeria in an international friendly at the Orlando Stadium and the team will look to be more clinical in the final third. "Yeye" says that a win against the North Africans is important as they look gain some momentum going into the Africa Cup of Nations. "It is not fair to only blame the strikers because all of us as players we have the responsibility to score and help the team win. Midfielders and defenders missed chances against Norway and this time around we all have to go for goals. “We have to finish on a top note so that we go into the Cape Verde game full of confidence. We need goals and a win on Saturday," the Kaizer Chiefs midfielder expressed. South Africa open the AFCON on January 19, when they take on Cape Verde at the National Stadium (FNB Stadium) in Soweto.